19 Baseball San Francisco Giants World Series Champions Display Case | Sports Memorabilia! 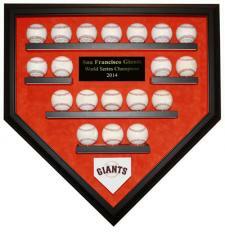 This high quality, San Francisco Giants American hand made baseball display case holds 19 baseballs. This display case looks awesome as pictured in the black frame with the orange suede mat. However, other wood choices and mat colors are available. Each 19 baseball display case has museum quality 99% UV protection glass to help prevent fading of the autographs on the baseballs. The solid wood case has a lock and key front door to easily access the baseballs. A high quality suede mat is used inside each baseball display case. You pick the wood finish, mat color and specific nameplate wording for each custom made display case. Each baseball display case comes ready to hang and the hardware for the wall is included. With the different nameplate options, this baseball display case can be World Series specific or used generally for autographed baseballs from any of the San Francisco Giants since their establishment in 1958. The dimensions are 27" wide and 27.5" tall and each case weights 15 pounds. Baseballs are not included with the baseball display case. Each display case is custom made to your order. Extensive packing materials and wood is used to protect each display case during shipping. USA shipping and handling is $40 per case (call for shipping costs to Hawaii or Alaska). You will be very pleased with this high quality baseball display case from National Sports Distributors.